This blog is intended to go along with Population: An Introduction to Concepts and Issues, by John R. Weeks, published by Cengage Learning. The latest edition is the 12th (it came out in 2015), but this blog is meant to complement any edition of the book by showing the way in which demographic issues are regularly in the news. A couple of weeks ago I received an invitation to attend an event that will be held today at the University of California, San Diego, hosted by the UCSD Center for Comparative Immigration Studies. The discussion will feature two of the three authors of a book just published by Harvard University Press, titled "Why Muslim Integration Fails in Christian-Heritage Societies." Since I couldn't go, I bought the book instead and just finished reading it. I encourage you to do the same. This is not a polemic--it is a research-based book, building largely on findings already published in peer-reviewed journals. The research focuses on France because the authors (one of whom is at UCSD, another at Stanford, and the third at the Sorbonne) were able to conduct a natural field experiment of sorts there. Work was completed prior to the recent spate of terrorist attacks in France, so it was not inspired by them. In France, they were able to identify Christian and Muslim immigrants from the same areas of the West African nation of Senegal. This provided the opportunity to "hold constant" the place of origin and socioeconomic characteristics and test the impact of the difference in religious background among this group of immigrants. I won't leave you in suspense. Similarly situated Senegalese who were Muslim were discriminated against more than their Christian counterparts. This suggests something beyond "simple" xenophobia and, as the authors suggest, something closer to Islamophobia--xenophobia with a specific religious content. Their conclusions about why this exist are very interesting. They offer evidence that the blame falls on both the Muslim immigrants and the host societies. For their part, Muslim immigrants are more likely than non-Muslim immigrants to identify themselves as different, and to showcase those differences. This increases the level of rejection from the host society, and contributes to further separation between immigrants and the host society. For its part, French society (and other western countries) spend too little time and effort trying to assimilate Muslim (and other) immigrants into the mainstream, including language instruction, lessons in civics and history, and basic job skills that fit the local economy. The authors argue persuasively, in my view, that the assimilation model is much more likely to work than the multicultural model. The idea that "diversity makes us stronger" only works if the diversity is blended in, not if it is set apart. The immigrants and the host societies need to understand that and work together on this. Let us be honest John: Muslims seldom integrate in any non-Muslim society. I am Distinguished Professor Emeritus of Geography and Director of the International Population Center at San Diego State University. 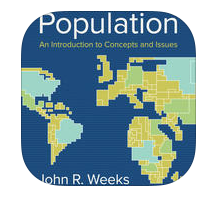 The app provides learning objectives and main points for each chapter, along with a quick POPquiz to test knowledge about key population information, and there is also a link to the WeeksPopulation blog. Do Super Bowl Victories Really Cause Baby Booms?